But never fear! Everyone’s been there, and everyone’s gotten through it and made it out alive. You’re not an admissions mistake — you’re just going through a transition period. There’s a learning curve to be a Dartmouth student, after all. So, let’s take a look at the things you’ll need to ace the whole college thing! Yes, you probably still have time to sit down and get Foco meals with your trippees, your roommate and maybe, like, one floormate. But things do get busy here, and you’ll be on a time crunch — that means no time to wait around in lines at Collis, the Hop or KAF. That leaves grabbing a cold sandwich from Novack as your only option, and needless to say, that’s grim. Do yourself a favor and buy a to-go container ASAP so you can get nice hot, nutritious meals at Foco to eat while reading your textbook on 4FB. Your roommate may snore. A dorm party on your floor may be going hard at three in the morning the night before your 9L midterm. The possibilities of what makes a dorm building an awful place to sleep are endless, and it’s much easier to pick up a nice pair of earplugs (free at the Student Wellness Center, third floor Robo) than to think about what the squeaking next door is. Different people prefer different methods. I’ve seen bullet journals and to-do list notepads; or, if you’re like me, you might want something digital instead. Regardless of what you like to use, having a good way to track all the things you need to do is crucial for success. This applies to literally anyone with skin. Get over yourself and face the facts; winters here are brutal, and if you have dry skin, it will crack like an eggshell. And that’s not the look of a thriving ’22. I’m sure this feels like something far away and irrelevant since your frat ban is a whole eight weeks. But those weeks go by super quickly at Dartmouth, and you’ll save yourself the hassle of frantically deciding which of your jackets is worth sacrificing on your first night out. Do not underestimate the filth or the frequency of jacket thefts in frat basements. Pro tip: cloth shoes are a no. Sometimes the bandwagon is a nice place to be. Those shirts only matter once — wear them to the Homecoming bonfire! Don’t miss the opportunity. Get creative — it can be anything! Maybe it’s a friendship bracelet you got from your best friend, or a birthday card from your aunt, or in my case, a four-foot-long stuffed shark. Whatever it is, have something you cherish to get you through the hard times. I sincerely hope that everyone reading this article downloaded this app Week 1 and is scoffing, but for the select few that may not have it yet, let me tell you now: if you plan on doing literally anything at all outside of classes with other people, chances are, GroupMe is the main form of correspondence and you’ll miss out without it. Besides, how would you join the Free Food GroupMe without it? This one isn’t super time-sensitive, so you don’t need to rush to find one during fall term. In fact, you might not find one until your sophomore year, and that’s totally okay! 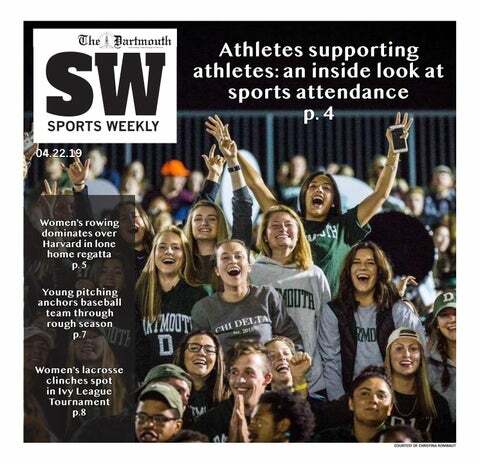 Regardless of how far you are in your Dartmouth career, having one Dartmouth upperclassmen or alum that you can rely on for some sage advice will come in handy. Questions about certain classes, majors or profs? FSP and LSA application advice? Inquiries about rush and Greek Life? Have no idea how to get jobs and internships? These are all things you should ask an upperclassman you trust, and someone you’re close with can be trusted with personal information and will know enough about your goals and strengths to give words of wisdom tailored to you. Luckily, these are easy to get, and the return-on-investment will be huge! De-stress by writing hilarious articles and have a platform to share your opinions and flex your writing muscles — and meet some cool people. Once you have that and everything on this list, you’ve got everything you need to thrive!